Our Heros Night out is an organization that Honors the Homeless Veterans from the Salvation Army facility at the Northport V.A. 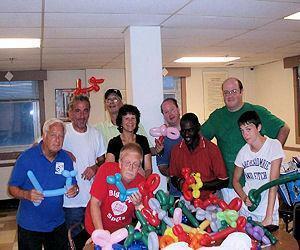 We bring fun entertainment to the facility or take them out for a night of fun. We need your help in honoring these well deserving men and women. If you would like to share your talents, sponsor an event or have an idea to help us, please call Carol Klein at 516 579-6524 or visit our website and click on the link to "Our Heroes Night Out". This is a really incredible organization run by some amazing, caring individuals. It's been wonderful to get involved, and I am really am proud of everything that we've done for our nation's vets! Wonderful community service organization doing great things for our country's heroes. Glad to post a nice review for them with Veterans Day just around the corner. I'm going to start volunteering soon! The men and women of our Armed Forces do their jobs with pride, and we should treat them with respect and honor. I have offered my services to the folks at Our Heroes Night Out, and really hope they allow me to participate in honoring our well deserved Veterans. Do you have any experience using Our Heroes Night Out? If so, please rate your experience and let others hear about it using the form below.